Before I go any further it needs to be clear I am explaining this in my own way on the fly, I will make adjustments over time. This will be a multi part blog post. 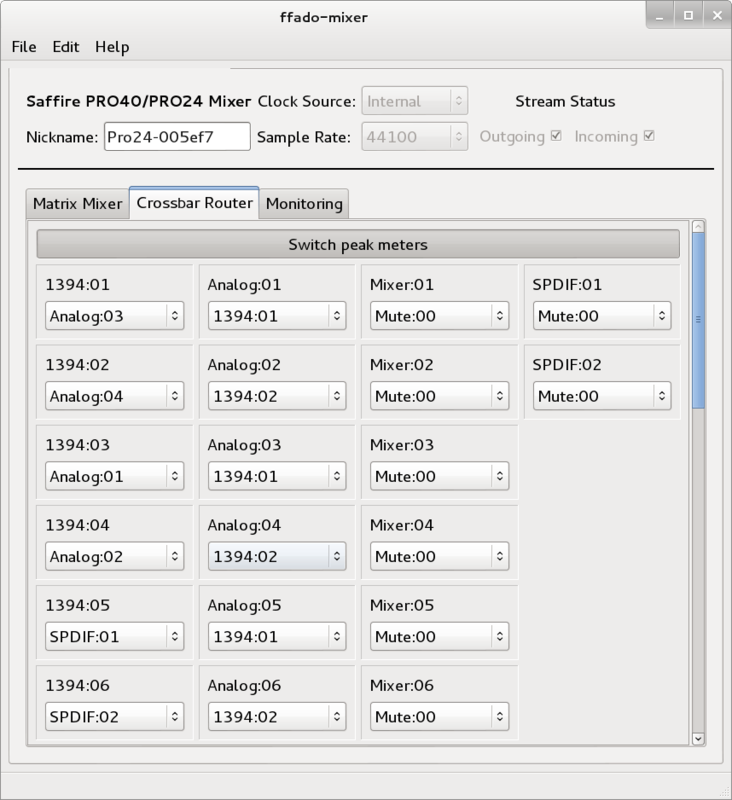 Here is a bit of information on managing the Focusrite Saffire Pro24 via ffado-mixer & qjackctl on a Debian 7 Linux system. Make sure the power is switched ON for the Pro24 before you turn on your computer. After the system is up and running start qjackctl and ffado-mixer, I prefer to run them from the command line in a terminal window to monitor any possible message output. You should see a screen similar to this one when ffado-mixer launches. Now this section was difficult at first (still is sometimes) to wrap my head around. So for this little blog post I am just going to post a brief overview of how its setup and why for this tracking system. Click on the Switch Peak Meters button to help test the Pro24’s inputs, usually best for first time setups until a working configuration is determined for both input and output connections. The Pro24 has 6 inputs, Analog 1 & Analog 2 XLR or 1/4, Analog 3 & Analog 4 1/4, inputs 5 & 6 are SPDIF connections via a Startech SPDIF input converter. Now lets get to the ffado-mixer’s Crossbar Router settings. In the first column is a list of the total possible 1394:0x firewire inputs available from ffada-mixer NOT the total number of inputs on a single Pro24 though. An expansion ADAT unit can be connected for an additional 8 inputs but that is for another blog post. To keep it simple for this setup we only care about the first 6 inputs, 1394:01 through 1394:06. Think of these as inputs 1 through 6 on an analog console if you come from the great analog recording days. From the drop down menu in each of the 1394:0x inputs we can select a corresponding Analog or SPDIF input from the Pro24 and make a connection between them. In my mind I like to think of it as an Analog to Digital patchbay. For some reason unknown to this blogger ffado-mixer recognizes Analog inputs 1/2 & 3/4 of the Pro24 backwards. So we will correct this by patching the inputs so they line up correctly with jack and other audio applications. 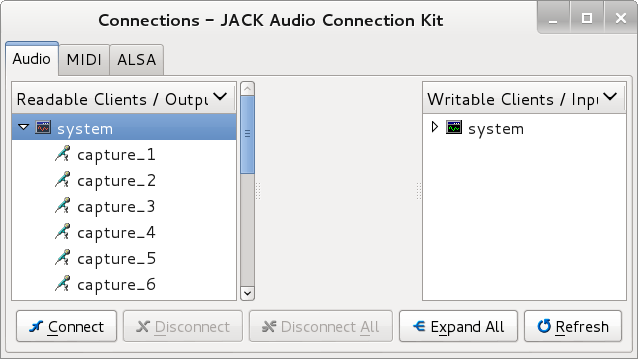 Now when we fire up qjackctl and open the connections window capture_1 through capture_6 correspond to the Pro24 analog inputs 1 through 4 and SPDIF left & right inputs respectively. So now all the inputs are patched and ready to pass a signal to either an audio application, system output or combination of both. 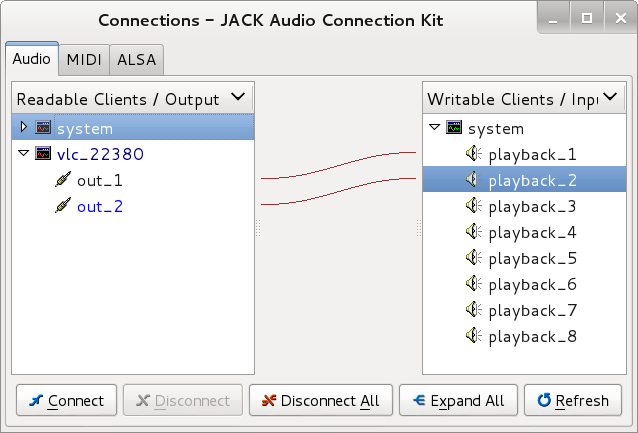 If your trying the setup explained here connect your audio applications and/or system capture_x Readable Clients in qjackctl’s Connection window to playback_1 (left) and playback_2 (right) in the Writable Clients in the same Connections window. This effectively is the monitoring patch, you should be able to hear any source you connect to playback_1 & playback_2 coming from your studio speakers and/or headphones if you set your system up in this manner described, make sure to turn the volume dials up on the Pro24 slowly as needed also. VLC application connected to playback_1 & playback_2. At the time of this blog post the current setup has the Pro24 patched to be used as 6 inputs to Ardour and also stereo output signal patching for monitoring mixes from Ardour to the headphone jack, Analog 1 1/4 Out to Left Studio Monitor, Analog 2 1/4 Out to Right Studio Monitor, Analog 5 & Analog 6 1/4 Out’s to Studio Sub Monitor. Analog 3 & Analog 4 Out’s are used as Left and Right outputs to a separate monitoring console in another room or sometimes a analog tape unit when needed. The output signals of Analog 3 & Analog 4 are also the output signals going to the Headphone jack on the front of the Pro24. Column 2 of the Crossbar Router corresponds to the analog outputs 1 through 6 and also headphone output of the Pro24. I set all other drop down menu selections in the Crossbar Router section to Mute just as a personal preference. That is has been a quick and dirty overview of my tracking setup using Debian Linux a Focusrite Saffire Pro24 and ffado-mixer, more detailed posts will come in the future for this and other setups. ALWAYS make sure everything is turned all the way down before connecting or disconnecting items in the signal chain, better to be cautious than blow stuff up. Part 2 will go over Monitoring in the next post. ← Experimenting is good inspiration!